A vital function of any newsletter is to keep subscribers informed. 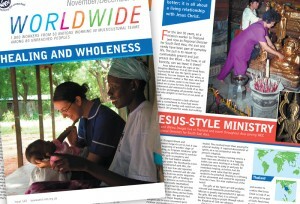 In the case of WEC Worldwide newsletter, it’s also to inspire. This monthly 12 page newsletter was sent to a readership which spans continents and all age groups. Packed full of stories based on the works of it’s own readership, these newsletters serve to highlight the efforts of some of the society’s more adventurous members. The simple design provides a colourful and interesting backdrop to the heroes of the newsletter… the heart-warming and sometimes heart-rending stories provided by the readership itself.